Savvy Shields (21), Miss Arkansas, was crowned Miss America 2017 in Atlantic City, New Jersey last night. She defeated 51 other delegates to win the crown. 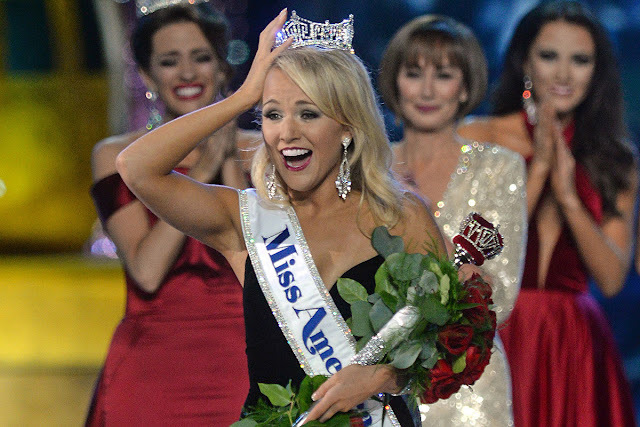 As the 96th Miss America, she will travel around the United States for the next year to appear at events on behalf of the Miss America Organization. She is the third woman from Arkansas to wear the crown with the last two winners wearing the crown in 1964 and 1982. South Carolina's Rachel Wyatt finished as the runner-up and New York's Camille Sims was named the second runner-up. Miss Washington, Alicia Cooper was named the third runner-up and Miss Mississippi, Laura Lee Lewis was named the fourth runner-up. The delegates from Maryland and Texas completed the top 7. Misses California, Iowa and Tennessee made the top 10, while Kentucky (America's choice) and Oklahoma made the top 12 and Idaho, Louisiana and Massachusetts made the top 15. I am quite surprised. South Carolina, Maryland and Texas seem stronger. Loved the winner and 3 of the other 4 finalist. She was the right choice. I was shocked Texas made it as far as she did based on her swimsuit performance. To me, Texas was a wreck. I am surprised Michigan and Hawaii didn't make it to the Top 15. And sadly, Vermont still hasn't made it to the Top 15.... Miss USA had the Delaware Curse, I guess Miss America has the Vermont Curse!